HMA temperature has a direct effect on the viscosity of the asphalt cement binder and thus compaction. As HMA temperature decreases, its asphalt cement binder becomes more viscous and resistant to deformation, which results in a smaller reduction in air voids for a given compactive effort. As the mix cools, the asphalt binder eventually becomes stiff enough to effectively prevent any further reduction in air voids regardless of the applied compactive effort. The temperature at which this occurs, commonly referred to as cessation temperature, is a function of the mix property factors in Table 1. In some literature it is reported to be about 79oC (175°F) for dense-graded HMA (Scherocman, 1984; Hughes, 1989). Below cessation temperature rollers can still be operated on the mat to improve smoothness and surface texture but further compaction will generally not occur. Conversely, if the binder is too fluid and the aggregate structure is weak (e.g., at high temperatures), roller loads will simply displace, or “shove” the mat rather than compact it. In general, the combination of asphalt cement binder and aggregate needs to be viscous enough to allow compaction but stiff enough to prevent excessive shoving. Take maximum advantage of available roller compactive effort. Rollers can be used where the mat is most receptive to compaction and avoided where the mat is susceptible to excessive shoving. Ensure the mat is compacted to the desired air void content before cessation temperature is reached. 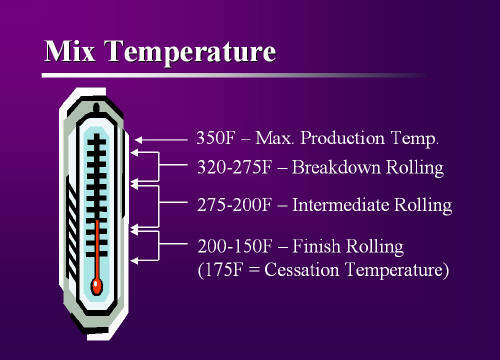 This can be done by calculating the time it takes the mat to cool from initial temperature to cessation temperature. All compaction must be accomplished within this “time available for compaction”. Initial mat temperature. Higher initial mat temperatures require more time to cool down to cessation temperature, thus increasing the time available for compaction. However, overheating the HMA will damage the asphalt binder and cause emissions. Mat or lift thickness. Thicker lifts have a smaller surface-to-volume ratio and thus lose heat more slowly, which increases the time available for compaction. Temperature of the surface on which the mat is placed. Hotter surfaces will remove heat from the mat at a slower rate, increasing the time available for compaction. Ambient temperature. Hotter air temperatures will remove heat from the mat at a slower rate, increasing the time available for compaction. Wind speed. Lower wind speeds will decrease mat heat loss by convection, which will increase the time available for compaction. Jordan and Thomas (1976) point out additional factors affecting mat cool-down rate that include mat density, pavement layer thermal conductivity, specific heat, convection coefficient, incident solar radiation and coefficients of emission and absorption of solar radiation for the pavement surface. David Timm, Vaughan Voller and David Newcomb have developed a software tool at the University of Minnesota called Multicool that automatically calculates pavement cool-down rate and time available for compaction. Table 2 is a sampling of MultiCool output for some representative values of pavement thickness and ambient temperature. Air temperature same as base temperature. MultiCool is quick and powerful. It can easily be installed on a laptop and used by contractors or inspectors to give a general idea of the time available for compaction on a given job site, which can be quite helpful in determining roller use and patterns. Figure 1 relates HMA temperature with typical aspects of compaction. Figure 1: HMA temperature vs. compaction aspects. HMA temperature affects its binder viscosity, which affects compaction in two ways: (1) the colder and more viscous the binder, the less actual amount of air void reduction for a given compactive effort, and (2) HMA can only be compacted until it reaches cessation temperature, therefore initial HMA temperature and mat cool-down rate establish a fundamental compaction parameter – the overall time available for compaction. Many factors influence HMA temperature and cool-down rate including initial mat temperature, mat thickness, temperature of the surface on which the mat is placed, ambient temperature and wind speed. Using these factors as inputs, MultiCool , a program developed at the University of Minnesota, can easily produce a mat cool-down curve and calculate the time available for compaction. Mix aggregate and binder properties can also affect compaction. They do so by affecting (1) the ease with which aggregate will rearrange under roller loads and (2) the viscosity of the binder at any given temperature. Coarse aggregate. Surface texture, particle shape and the number of fractured faces can affect compaction. Rough surface textures, cubical or block shaped aggregate (as opposed to round aggregate) and highly angular particles (high percentage of fractured faces) will all increase the required compactive effort to achieve a specific density. Midsize fine aggregate (between the 0.60 and 0.30-mm (No. 30 and No. 50) sieves). High amounts of midsize fine, rounded aggregate (natural sand) cause a mix to displace laterally or shove under roller loads. This occurs because the excess midsize fine, rounded aggregate results in a mix with insufficient voids in the mineral aggregate (VMA). This gives only a small void volume available for the asphalt cement to fill. Therefore, if the binder content is just a bit high it completely fills the voids and the excess serves to (1) resist compaction by forcing the aggregate apart and (2) lubricate the aggregate making it easy for the mix to laterally displace. Fines or dust (aggregate passing the 0.075-mm (No. 200) sieve). Generally, a mix with a high fines content will be more difficult to compact than a mix with a low fines content. The asphalt binder grade affects compaction through its viscosity. A binder that is higher in viscosity will generally result in a mix that is more resistant to compaction. Additionally, the more a binder hardens (or ages) during production, the more resistant the mix is to compaction. Asphalt binder content also affects compaction. Asphalt binder lubricates the aggregate during compaction and therefore, mixes with low asphalt content are generally difficult to compact because of inadequate lubrication, whereas mixes with high asphalt content will compact easily but may shove under roller loads (TRB, 2000). Sometimes, a combination of mix design factors produces what is known as a tender mix. Tender mixes are internally unstable mixes that tend to displace laterally and shove rather than compact under roller loads.